Ayanami's Begleiter, who has been mentioned only in the first drama CD so far, and to whose grave Ayanami said "There is only one Begleiter I have loved, which is you." Many people believe that the officer who appears in Ayanami's memory and says "watashi no ou wa anata dake desu, Ayanami-sama" (Only you are my king, Ayanami-sama) in manga chapter 26 is Yukikaze, because Hyuuga doesn't use the teineigo when he talks with Ayanami. But we still do not know the name of that officer yet. 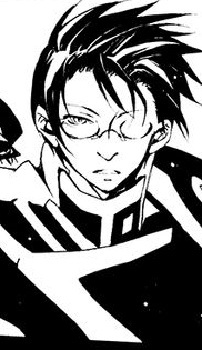 In a one-shot manga illustrated by the authors of 07-Ghost titled Begleiter, Ayanami had a Begleter before he became the Chief of Staff, but he died to protect Ayanami in a battle. Since then, Ayanami has been rejecting anyone who applies for that position. When Hyuuga said "He (Yukikaze) isn't the only one who cares about you," Ayanami warned Hyuuga by pointing his sword at him.